All prices are inclusive of GST. All delivery times stated are approximately and can be delayed. Some outer regional areas may have additional delivery times. FREE HOME DELIVERY Australia Wide (Free delivery is applicable only for Metro and Regional area. If you are in an island, please give us a call on 1300 66 77 48 for a shipping quote. The 3m x 3m Garden Shed that fits your storage requirement and your budget! From ABSCO’s popular Eco-nomy Range, this shed can accommodate your lawn mower and other backyard necessities without being a problem for your limited space. The 3m width lets you have the storage room you need for all your tools and equipment. And the 2.26m depth and double doors give you easy access to get them in and out of the shed whenever you want to. Just like all other Eco Sheds by ABSCO, it’s made of high-tensile steel with lower environment impact and cost – when compared with most metal shed materials. With the SNAPTiTE system, it’s also easy to install. It’s one of the best-value sheds you can find today! This shed uses SNAPTiTE – the World’s Easiest Assembly System! About the Manufacturer - ABSCO Industries is a wholly owned Australian company that manufactures garden sheds, garages and other outdoor buildings made of quality steel that’s also made locally. Its main facility is located in Brisbane, QLD, and its product distribution extends from all over Australia to the Pacific region and Europe. Help other Simply Sheds users shop smarter by writing reviews for products you have purchased. These Sheds are supplied without a floor and are best suited to be anchored with one of our anchor kits to a concrete slab. Alternatively if you are renting your property, plan to move it in the future or putting it onto another flat surface (grass, dirt, bricks or road base) you can fasten them to a temporary wooden base (e.g. railway sleepers buried in the ground) or using ground anchors. This is why we sell so many of these sheds. Watch the video below to see the SNAP-TITE system in action. Why shop around when you know you can get the best price from Simply Sheds? Even if you find a better price up to 30 days AFTER you've bought! We know you’re busy and you have better things to do than to visit every shed company in Australia when you’re getting your new shed. Comprehensive Written Manufacturer's Warranty... Quality Guaranteed! All products have been engineered and manufactured using quality endorsed materials and all Absco Sheds designs have been tried, tested and perfected from over 10 years’ experience in the building industry. All their products go through an extensive quality control procedure and each shed carefully packaged into specially designed reinforced cartons for safer transporting and to make sure all parts are included. Just in case anything is missing or damaged on delivery call us immediately and we will express dispatch it to your home. Simply Sheds ensures we offer the most competitive prices. Product Prices and availability are subject to change without prior notice. We will honor the item's Buy Price that was shown in your checkout page plus any shipping fees applied only on Paid and Completed transactions. All orders are tracked via an individual consignment number which we will send to you as soon as your product leaves the factory, most deliveries happen within 7-10 business days (east coast of Australia, some regional and WA deliveries may take a few extra days). We keep you informed each step of the way via SMS and email so that you know what is happening and when, and if you need anything, one of our friendly experts are happy to help. NOTE : Delivery Time frame applies to Garden Sheds and Aviaries only and may vary depending on your location and product availability . For Carports, Garages and Patios - delivery can take up to 3 weeks since most of these items are made to order and has longer production time frame. Option 1: Free Delivery to a local depot. We have a network of over 60 Transport depots across Australia where you can pick up from for free. Through the purchase process you will be able to choose your depot and we'll deliver it there free of charge. As soon as your shed arrives there the local depot will give you a call to let you know it's ready for you to come in and pick it up. Your shed will come flat packed to make it easy to pick up in a station wagon, ute, trailer or using roof racks. NOTE: Since we are providing a free delivery service to a local depot, Mainfreight will hold the shed for 48 hours. We will notify you of the status of your delivery, but after this time, it is possible you will be charged storage fees by Mainfreight. If you are wanting to take advantage of our incredible prices now, you can do that, and simply email us and let us know when you’d like your shed delivered to avoid this issue. For Absco Garden Sheds, we offer you a FREE HOME DELIVERY for all Metro Sydney, Brisbane, Melbourne, Adelaide & Perth only, while a flat rate of $89 applies for Regional Areas. When your shed arrives, the home delivery company will give you a call and arrange a suitable time to deliver your shed. NOTE :Our freight company requires all home deliveries to be to the front of the property only, and require the assistance of an able bodied person to help with unloading the shed. If this is not possible, an additional charge of $90+GST will need to be added to the order to provide a 2 man delivery service. An alternative solution would be to take advantage of our free delivery to a local depot, and then organise a pickup by a handyman. Most handymen services range between $40-$60 an hour so this may be a more economical solution for you. The rates given above applies to Garden Sheds and Aviaries only, Heavier outdoor building structures ( garages, patios, carports etc..) shipping fee may cost more depending on your location. As a standard process, once you receive your order, please check all the parts immediately before installation. Make sure that you have received the correct item and have all the components complete. We will only process damaged, missing and wrong parts requests on cases reported within 24 hours after delivery. * If you suddenly change your mind and would like to replace your order – and your item has already been dispatched or delivered – there will be a 25% re-stocking fee (sometimes a return shipping cost depending on your location). Just shoot us an email requesting for the replacement and confirming the item that you would want to get a replacement and our customer service people will be able to further assist you. When we receive the returned item, we will immediately process the new one and apply your original credit to your new order. Please be assured that we will offer you the best possible price on the replacement shed to make up for the difference where we can. Any opened package will no longer be eligible for return or replacement. If there is a redirection required, please be advised that you may incur a redelivery fee as this is the fee that we are charged by the shipping company. 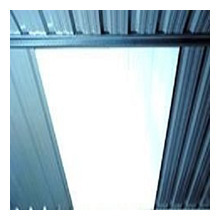 Garages, Carports, Workshops and other such large products are made according to individual specifications and cannot be cancelled or replaced once manufacturing has started. If in the event that we make a mistake or the transport company lose or misplace your item, we will ship you out a new product as soon as possible to replace the one you ordered. Please get in touch with our Customer Service Personnel so we can assist you on how we can amend your orders. NOTE: As a standard process, once you receive your order, please check all the parts first before installation. We will only process damaged, missing and wrong parts requests on cases reported within 24 hours after delivery. ZipPay - Buy now, Pay later. 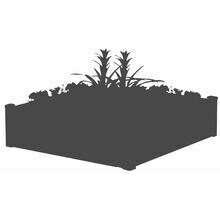 If for some reason you get stuck, or need hand with anything (whether it is to do with ordering or just needing help asking about slab sizes or colours), feel free to give us a call on 1300 66 77 48, chat to us live (you’ll see the box on the bottom right of your screen if we are online) or drop us an email through the Contact Us form. Simply Sheds will begin to process your order once payment is completed made via Credit Card for the total amount due shown in the check out page (including shipping fees and other charges). In any case that you are unsure of your order status, pls. free to call us on 1300 66 77 48. If you made a payment via Bank Deposits and Money order, orders will be processed once payment hit our account. In the event that we did not receive any payments for Order placed within 7 days, Simply Sheds reserves the right to cancel the transaction. We will send you an Order confirmation once your order is being processed after it is verified and has passed our validation process to prevent Credit Card or Payment fraud. We will contact you by email or phone call if we cannot process or fulfill your orders after payment is received. 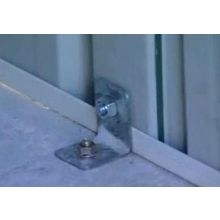 Needed for a permanent secure fixing to a concrete slab. 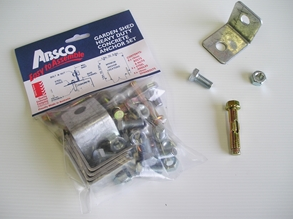 Set includes 8 Anchor brackets, Fixings and Dynabolts. 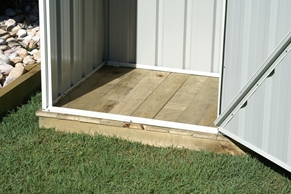 This is the perfect solution if you don't want to go to the hassle of installing a concrete slab, and even means you can move the shed easily down the track to another spot in the yard or even another house if you're renting. © 2019 SimplySheds. All Rights Reserved.